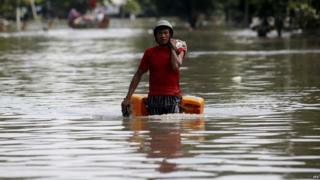 At least 47 people have died and tens of thousands of people have been affected by flooding in Myanmar. A state of emergency has been declared in the four worst-hit regions in the west, and the UN has warned the death toll is likely to rise as remote areas are reached by aid agencies. Some areas have seen 1,000mm (3.3ft) of monsoon rain in the past week. Floodwaters brought by the same weather system have also killed at least 100 people in India in the past week. Local people have said it is the worst flooding in decades. "There was no warning," Aye Myat Su, 30, told AFP news agency. Like many people in the poor town, she was taking refuge in a monastery. "Within a few hours, the whole house was underwater. My husband had to get onto the roof as there was no way out." In some areas, people have been stranded on rooftops, waiting for boats to rescue them. President Thein Sein has said many paddy fields had been damaged by floodwaters, and promised to find ways of compensating farmers. "Myanmar government team will try our best to help them for resettlement and recovery process," he said on local media. Opposition leader Aung San Suu Kyi went out by boat to visit evacuated people in Bago, north of the capital, Yangon, on Monday. Chin and Rakhine states have been declared disaster zones, along with the Sagaing and Magway regions. An official in Rakhine state, on the western coast, said the death toll there could reach "several hundred". The state was badly hit by Cyclone Komen at the weekend. "There are a number of far flung areas that we haven't been able to reach," Reuters quoted Hla Saw as saying. The UN said the flooding had caused extensive damage to refugee camps in Rakhine state, which are home to some 100,000 internally displaced people. Most are Rohingya Muslims who were displaced in communal violence in 2012.